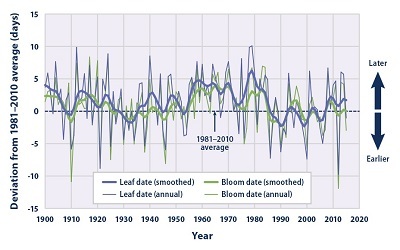 ﻿ Fun Easy English - Environment - Global warming - Climate change Indicators: Leaf and Bloom Dates. Other studies have looked at trends in leaf and bloom dates across all of North America and the entire Northern Hemisphere. 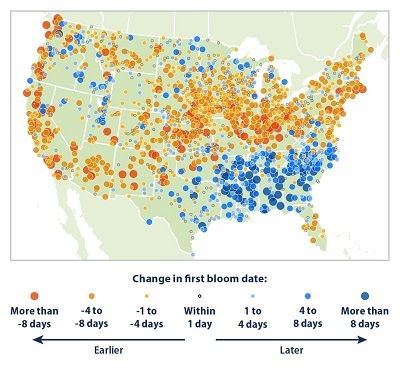 These studies have also found a trend toward earlier spring events—some more pronounced than the trends seen in just the contiguous 48 states. Scientists have high confidence that the earlier arrival of spring events is linked to recent warming trends in global climate. Disruptions in the timing of these events can have a variety of impacts on ecosystems and human society. For example, an earlier spring might lead to longer growing seasons (see the Length of Growing Season indicator), more abundant invasive species and pests, and earlier and longer allergy seasons. Unusually warm weather in late winter can create a “false spring” that triggers the new growth of plants to begin too early, leaving them vulnerable to any subsequent frosts. Because of their close connection with climate, the timing of phenological events can be used as an indicator of the sensitivity of ecological processes to climate change. Two particularly useful indicators of the timing of spring events are the first leaf dates and the first bloom dates of lilacs and honeysuckles, which have an easily monitored flowering season, a relatively high survival rate, and a large geographic distribution. 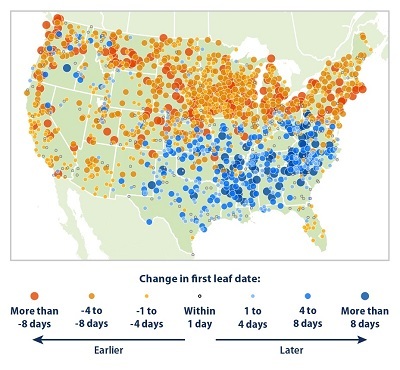 The first leaf date in these plants relates to the timing of events that occur in early spring, while the first bloom date is consistent with the timing of later spring events, such as the start of growth in forest vegetation. This indicator uses data from nearly 3,000 weather stations throughout the contiguous 48 states. The exact number of stations varies from year to year. For each year, the timing of first leaf and first bloom at each station was compared with the 1981 to 2010 average to determine the number of days’ “deviation from normal.” This indicator presents the average deviation across all stations, along with maps that compare the most recent 10-year period (2006–2015) with a mid-20th-century baseline (1951–1960) at individual stations. These time periods were chosen to match published studies. 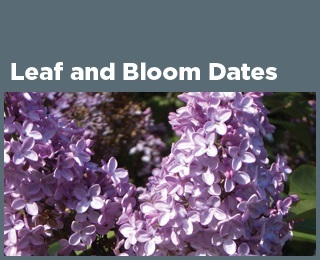 Leaf and bloom observations were compiled by the USA National Phenology Network and are available at: www.usanpn.org. This indicator is also based on temperature data from the National Oceanic and Atmospheric Administration’s National Centers for Environmental Information, which maintains a large collection of climate data online at: www.ncei.noaa.gov. Data for this indicator were analyzed using methods described by Schwartz et al. (2013).